Get ready to cheat on that diet. Since it’s January, I should stick to posting healthy recipes that complement everyone’s new years resolutions. But that quickly becomes boring, doesn’t it? We just had one of the largest blizzards in history in the North East so would you rather stay home and eat vegetables or stay home and eat Double Layer Caramel Brownies? In my opinion, there’s no comparison. Brownies, especially gooey caramel ones, are the perfect comfort food for a snowy evening by the fire or watching Netflix. If there’s one recipe my grandmother, Paula Peck, is known for, it would be her brownie recipe. It’s an easy classic and one of few chocolate recipes in her book, “The Art of Fine Baking.” A few years ago, Mark Bittman, former columnist of “The New York Times” and self proclaimed Paula Peck fan, referenced her brownie recipe in “Truth is in the Fudginess.” So when I wanted to make an even more decadent version, this base recipe was the natural choice. These crazy caramel brownies have not just one layer of caramel, but two. This really isn’t necessary and feel free to stick to one layer. The benefit of two layers is the flavor. These brownies have serious caramel flavor and are super sweet, rich, and delicious. You can still get the caramel flavor with one layer – it won’t be as intense, but it will definitely save time. Chewy chocolate with semi-sweet chocolate chunks and layers of sweet and smooth caramel make this brownie, way over the top…in a good way. I’m sure you’ve been working hard at that diet and exercising regularly so take a break and enjoy some chocolate caramel decadence. Since they are rich, cut these brownies in small squares. You will feel just as satisfied but not as guilty. 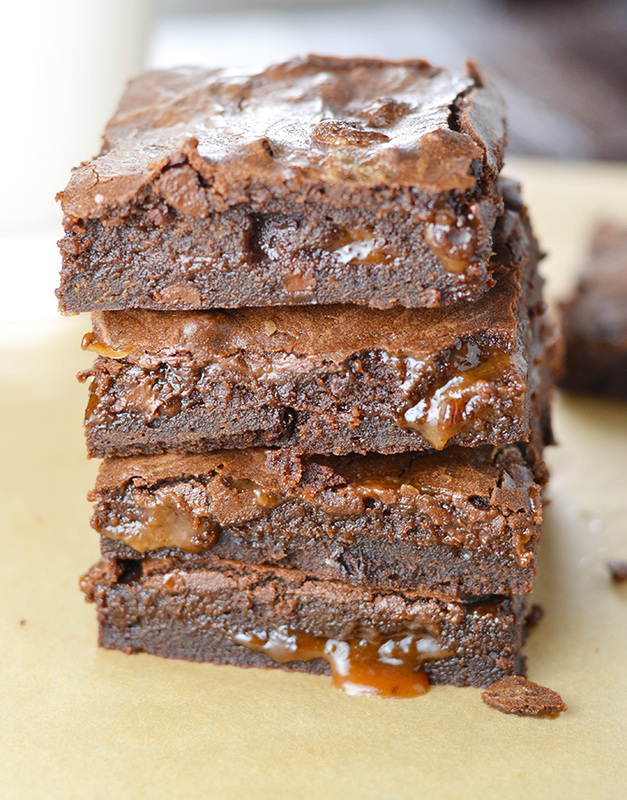 Either way, these dreamy Double Layer Caramel Brownies, are worth it. Line an 9x13 inch baking dish with parchment so that excess paper hangs over the edges. Make the brownie batter and stir in the chocolate chips. Pour 1/3 of the brownie batter in prepared baking dish. Spread evenly so that it covers the bottom of the pan. Bake 12 minutes until just barely set. Remove from oven. In a small saucepan, warm 1 cup cream, 4 tablespoons butter, and salt until the butter melts. Remove from heat and set aside. In a heavy large saucepan, combine the sugar and water. Stir until the sugar is wet and forms a paste. Do not stir the sugar after this point. Place over medium-high heat. Allow the sugar syrup come to a boil without stirring. Boil until syrup reaches 255 degrees. Remove syrup from heat. Slowly pour the warm cream butter mixture into the sugar syrup while whisking the sugar syrup gently. The sugar syrup will bubble up and triple in size. Return the pan to medium-high heat. Bring the caramel come to a boil without stirring. It will be light yellow but darken to reddish-brown caramel. Remove from heat again when the caramel reaches 245-250 degrees. Whisk in the vanilla, remaining cream, and remaining butter. Pour a think layer of caramel over brownie layer. Carefully spread. Place in the refrigerator or freezer for 5-10 minutes until caramel layer cools and sets slightly. Pour half the remaining browning mixture on top of caramel layer and carefully spread to cover. Bake 15 minutes until just set. Add another layer of caramel. Chill until set again and pour remaining brownie batter on top. Carefully spread to cover evenly. Bake 15-20 minutes until the top looks dry. Remove from oven. Cool and cut into small squares.